You know those days when you have along run planned and you wake up and know it’s just not going to happen that day? That was me on Sunday. A work event on Saturday had me on my feet all day handing out free shave ice and teaching people about the Port and left my leggies more tired than I was expecting. People are draining! I woke up when my alarm went off and hit the snooze and somehow managed to turn off the alarm. I didn’t wake up again until 8. Clearly I needed sleep. So instead I brunch with my girls and told myself I’d get it in. Fast forward to Wednesday at 4:30pm. I set off from my office to essentially run home. 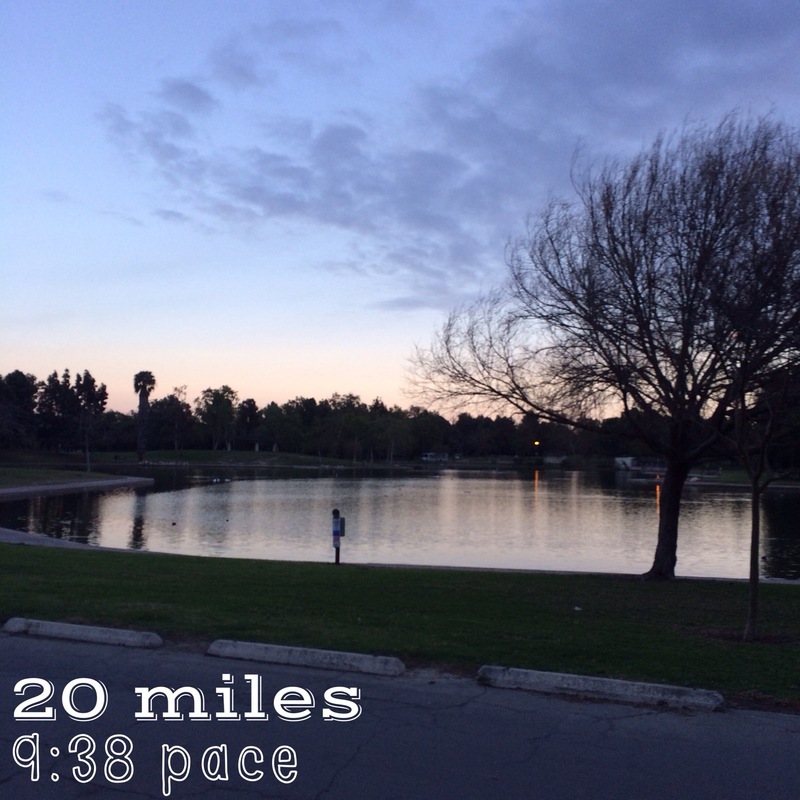 This was literally the chance I had to get in my long run before the LA Marathon to ensure I would have rested legs for the race. Plus we’re expecting massive rain this weekend (massive for SoCal at least), and I’m not about to run in the downpour. I was really surprised with how well the run went! I could tell I was tired simply from being at work all day, but overall it was a really great training run. I ran from the office to a park in Long Beach, down the (slightly creepy in the dark) San Gabriel River trail to my normal path through the Long Beach Marina and finished off on the beach bike path. I knew the key to actually getting this run in was running from the office to the house. I couldn’t stop in the middle or at mile 16 when I got tired; if I wanted to get home I had to run there. Isn’t it funny the little tricks we play on our minds to accomplish our goals? I kept a mostly steady pace between 9:30-9:50, with some slower miles on the river trail. By mile 14 I was back in a familiar area and picked up the pace a bit. I felt really great, tired legs and all. The last 6ish miles (especially the last 3!) I tried really hard to push myself and not just slog through the end of the run. I have a tendency to slack off at the end, just wanting it to be over. During a marathon sometimes I even walk in the last two miles, NOT a good habit! While I’m not going for any time goal at LA I want to finish strong in preparation and practice for when I do run for that goal again. My humble brag tonight is that I’m so proud of myself for getting this run in even when I really did not want to do it. Putting in 20 miles after a full work day is mentally exhausting I’m not going to lie, but I also kind of think it will help push me come marathon day, or at least I hope it does! I probably wouldn’t recommend it or do it again, but sometimes life just happens and you put in work when you can. Don’t you need your cat to help you take an ice bath? Post long run meal! 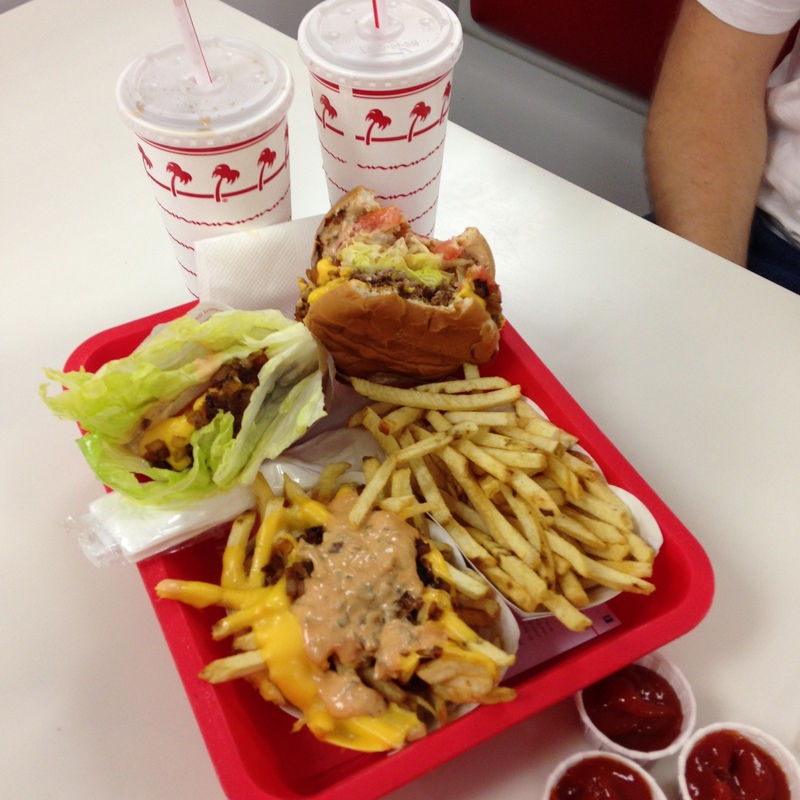 Protein style & animal style!